Chris Jones, Prostate Cymru’s ambassador and S4C weather presenter, is organising a prostate cancer fundraising weekend in aid of Prostate Cymru, the leading prostate health charity in Wales. 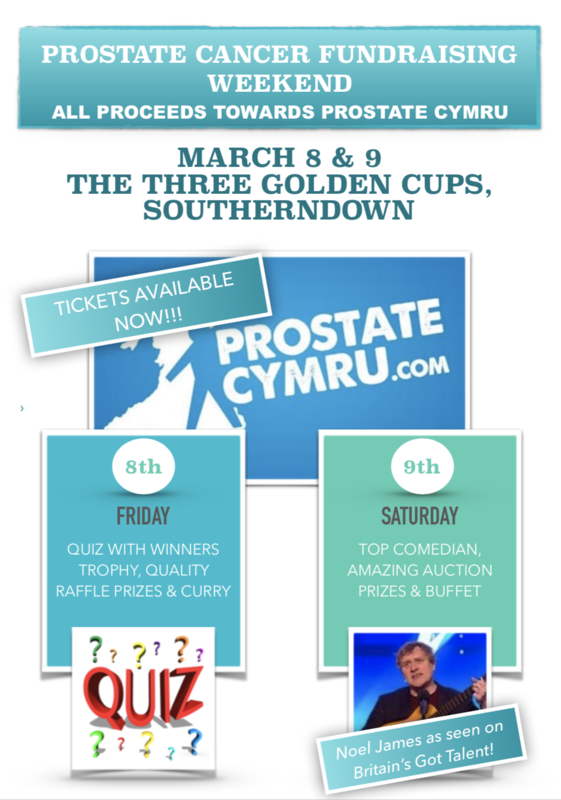 The event will take place at The Three Golden Cups in Southerndown, Vale of Glamorgan over two evenings: Friday 8th March and Saturday 9th March. The first evening is a great opportunity to test your general knowledge as there will be a quiz and the winners will receive a special trophy. There will be curry to help fuel your brain for the quiz and fantastic raffle prizes on offer. The second evening will feature brilliant auction prizes and a buffet meal with entertainment from Welsh comedian Noel James who reached the semi-final of Britain’s Got Talent in 2018. There are limited tickets available for each night. Tickets are on sale and available from The Three Golden Cups in Southerndown, Ogmore By Sea Post Office & Shop or directly from Chris Jones.